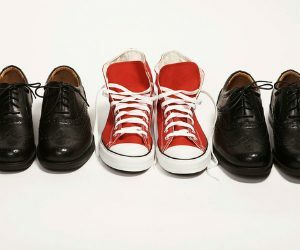 Making a fashion statement at the office – a tie with an unusual pattern or some snazzy red sneakers paired with a suit – may actually provide a bit of a career boost. Under most circumstances, not conforming to etiquette rules tends to garner social disapproval; showing up to a business lunch in your gym clothes, for example, is not likely to impress your clients. However, Harvard psychological scientists Silvia Bellezza, Francesca Gino, and Anat Keinan hypothesized that intentionally standing out from the crowd could also send a positive message conveying status, confidence, and power. In one of their field studies, the researchers coded for clothing worn by attendees at an academic conference. Generally, attendees dress in more formal business attire for these events, including blazers, collared shirts, or dresses. The researchers devised a ratings system to categorize how formally individuals were dressed, and rated the attire of 76 randomly selected conference attendees. The researchers then looked up the number of publications for each scholar included in the sample as a measure of status within the academic community. After controlling for the attendees’ gender, age, and years since receiving their PhD, the researchers found that wearing jeans and a t-shirt (a more non-conforming style) to a conference was significantly correlated with research productivity. Interestingly, this correlation was even stronger when focusing on publications in top-tier journals. “It could just be wearing a colorful tie, or colorful socks or, you know, different shoes. It has to be very clear that it’s deliberate,” study author Keinan explained to NPR in an interview. And research shows that what you wear doesn’t just influence how others see you – it may also influence your own self-confidence and performance. If you have a pair of lucky socks, research published in Psychological Science suggests you may want to make a point of wearing them for your next big presentation or job interview. Across four experiments, a team of researchers led by Lysann Damisch of the University of Cologne found that indulging superstitions can actually help people’s performance by improving their confidence. Damisch points out that many athletes rely on lucky clothes during competitions; Michael Jordan wore his college team shorts underneath his NBA uniform for good luck, and Tiger Woods wears a red shirt on tournament Sundays, usually the last and most important day of a tournament. Many people – including White House Press Secretary Robert Gibbs – have a lucky tie they wear for an extra confidence boost. Participants in the experiment were asked to bring a lucky charm along with them to the lab. One group of participants held onto their good-luck charms while completing a memory task on a computer, and the other group gave their charm to a lab member during the experiment. Those who got to hang on to their lucky charm not only set higher goals for themselves, but showed significantly better performance on the task compared to the other group. The next time you need to dress for success, don’t forget your lucky socks!